Brexit Today: Is there peoples’ support for a People’s Vote? In the last few weeks, the UK media has been full of talk about having a Second Referendum on Brexit. This interest in the last few weeks is mainly due to Parliament being in gridlock due to internal conflicts, and the view that one way out of this stasis is to turn the problem back to the people to have a second go. There have in parallel been a number of organisations set up to campaign for a second Referendum under the idea of a “People’s Vote”. However, there are some serious risks with holding a 2nd referendum, given that the Government committed itself to execute the decision of the first (in writing, in a document it sent to millions of homes) and Parliament would be seen as ignoring the first decision. We thus thought it would be interesting to look at our analytics system see what support there was for this, and compare this to other options being mooted and see the shift in mindshare against the general conversation. Is this discussion impactful or just noise du jour? Firstly, it’s worth looking at these topics as a % of the total Brexit conversation. Looking at Twitter, our system shows that all the sub-topic conversations around Referendums, Peoples Votes (and various related topics) are relatively small compared with the main topic – c 12.7% in total, of which the largest, at 5%, is the conversation about a Referendum. “Peoplesvote” and “Peoplesvote_UK conversations are about 4% combined. In contrast all conversations about “The Deal” are about double that of all the various Referendum sub-topics combined, at c 31%. 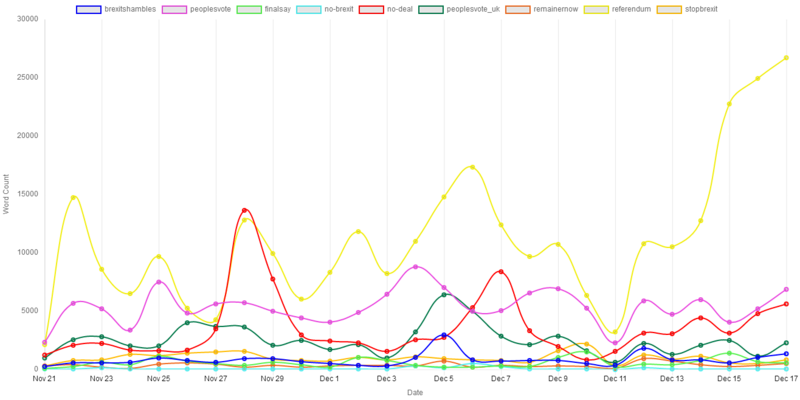 Furthermore, looking at its Influence, it is clear that even Referendum – the main meme in this group – is still barely above the pack of also-running memes fighting for mindspace, and the other topics are lost in the data swarm. So it’s not a major story – yet – but it is not insignificant and could well break out of the swirling morass. Thus it’s worth looking at a simple daily volume analysis of these conversations and how it is changing over time to see if it is on the rise. As you can see, the PeoplesVote and PeoplesVote UK conversations have been running along with no real change for c 3 weeks, the sharp jump has been in the Referendum conversation over the last week or so. Another view of the trend lines is shown below – looking at which are risers and fallers, and how are they doing relative to the overall conversation – this shows cumulative % growth over the same period gives a good picture of relative trend growth. The big thick red line is Brexit growth overall, the black line is the overall discussion on “the Deal”. Anything above the Brexit line is growing at a faster rate than the overall topic, so is taking over more mindshare, and anything beneath it is growing at a slower rate (i.e. falling mindshare). As can be seen, both the Peoples Vote options are declining, whereas the Referendum discussion has risen rapidly. “No Brexit” and “Finalsay” (a relatively new term for a 2nd referendum) are also growing rapidly, but from a very small base. Finally, it’s interesting to look at Sentiment – below are the fellow travellers’ relative sentiment levels, on a relative volume basis. As one can see, sentiment is defined by a series of spikes. This is largely due to specific tweets and their mass retweets by supporters of that particular point of view, on the day. There is some debate as to whether one should consider retweets or not when looking at sentiment impact. For this sort of application we would argue that including the retweets is a better predictor, because the large number of people retweeting are agreeing with the views/sentiment originally expressed so it is a valid count of their opinion. (Bots are a different matter, we scrub those). Note that “Referendum” had a huge positive spike on 22nd November (due in no small amount to a comment by a senior Labour party figure that he would vote Remain in a 2nd referendum and the resultant heavy retweeting by approving Remain supporters). Note however how the huge volume of conversation about “referendum” on the 22nd produced a very +ve sentiment spike, whereas the major growth in “Referendum” volume over the last few days has produced a far more muted +ve sentiment. This means more opposition is now getting involved with the topic. The Peoplesvote terms have already seen this effect, though interestingly, PeoplesVote tends to be mainly positive whereas PeoplesVote UK quite often delves way into negative sentiment territory. The “PeoplesVote” memes are losing traction as the referendum conversation rises, and other (seemingly more pro-Remain) terms like “Finalsay” and “No-Brexit” are now making headway. However the discussion is still relatively small overall, though not insignificant, and the growth rate of the referendum discussion is far above the Brexit mean. 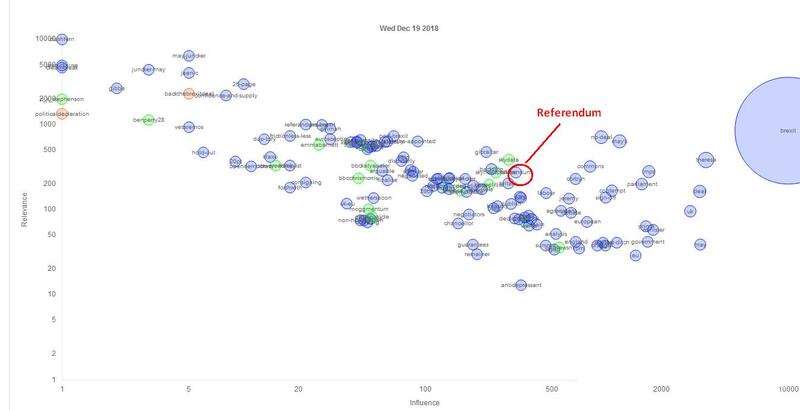 Sentiment-wise “Referendum” is strongly positive but now attracting opposition, the pattern we see of new terms attracting positive support from their supporters, then attracting detractors, and then settling down into a more neutral sentiment level seems relatively constant. In short, right now there is not enough traction in volume terms, and the concept of a 2nd referendum/people’s vote et al is still among the cluster of also-running views, but it is growing fast – though maybe morphing to a more overt pro-Remain story. Opposition is increasing however. It will be worth revisiting closer to the actual “meaningful vote” in Parliament on January 14th, which will drive this to a decision point (in theory, but we have been here before). Assuming there is still a Parliament in January, of course….. 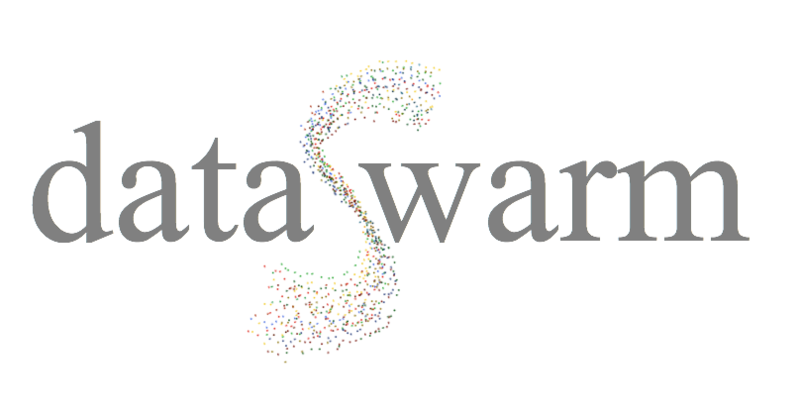 The DataSwarm Analytic Engine tracks opinions and ideas from social and other media. It registers their rise and fall in the mindshare of groups of people (this change over at any time what we call the Zeitgeist), whether of large groups like the British population, or smaller subgroups (for example cosmetics users, whisky drinkers, online TV consumers, bitcoin buyers and various other client projects). Just to make it more interesting (i.e. complicated), large groups comprise of smaller groups each with varyingly different idea and opinions sets. We also track how these varying idea sets combine, split, recombine and generate new Zeitgeists in different subgroups. 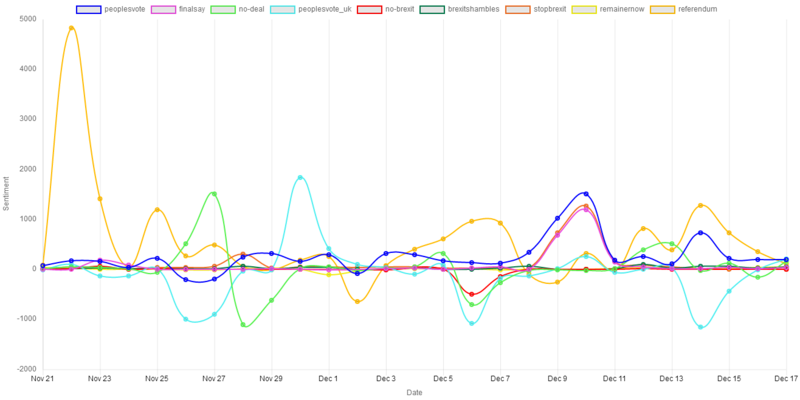 It’s fairly complex analytics, but very powerful – hence our ability to predict elections that surprise all the pollsters, pundits and politicians. ← Brexit Today – Where’s Boris?